Trousers, aircrew, combat, temperate (DPM), Mk.2/2A. Stores reference 22c/1300572. Size 3 (Ht. 64-68", waist less than 34"). 1971 dated. 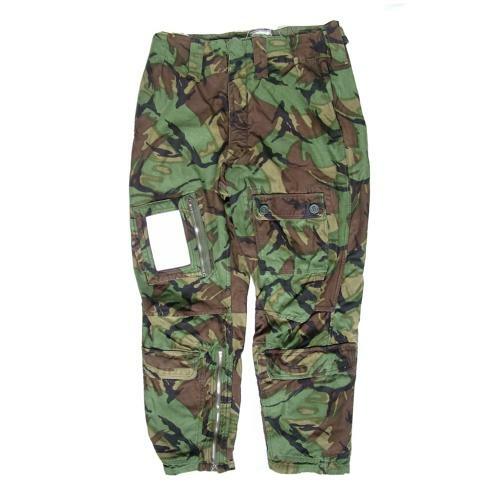 Lightly padded flying trousers in DPM with zipped side pockets and open pockets at the waist, button pocket on the left thigh and map/note pocket on the the right thigh. Flapped pocket on each lower leg. Zipped at the ankles. Velcro adustable straps at the waist. Originally fitted with integral braces but these have been carefully removed. These were intended for wear over a one-piece flying suit coverall for addiitonal warmth along with matching jacket (also available, stock code S23382). Very good '+' used condition. Stock code J23383.